Applying mulch over the soil around plantings to aid moisture retention, deter pests, and suppress weeds by denying them light and air. They also help to prevent soil erosion in our wet climate. It saves time and energy spent on watering and weeding in summer, while in the colder months they will provide protection for dormant roots. In addition, if you choose biodegradable materials, they will be tackled by earthworms and other organisms, enriching the earth and so saving you the job of adding fertiliser! If you don't have enough leftovers of your own, you may be able collect around the neighbourhood, and will perhaps be doing a favour to your neighbours by taking it away. Suitable material is also on sale at garden centres and outside large supermarkets. You may even be able to obtains some shredded wood from timber yards and tree surgeons, to make your own bark mulch. Any company that uses sacking will be only too glad for you to pick it up, and may throw in the residue from its original contents, such as spent grinds from coffee beans together with their original sack. As already pointed out, an extra advantage with a biodegradable garden mulch is the long-term goodness that it will add. Raid the compost heap or your pile of decomposing leaf mould; alternatively use manure, straw, mushroom compost, seaweed or wood shavings. Pay attention to the species you pick, too, or you will transport seeds that will germinate to defeat your efforts. Old newspapers and cardboard do a passable job in protecting plants and denying weeds, too, and will rot down to turn into compost eventually. Spent hops are very effective but dog owners should avoid these as they are poisonous to canines. Don't waste prunings from trees and hedges. While softer growth can be composted, larger branches and more mature wood can be shredded to make excellent bark mulch, with exactly the same abilities to provide summer moisture, winter protection, nutrients and weed control. A bonus with this is that it breaks down more slowly than other options, so won't need replacing so often. 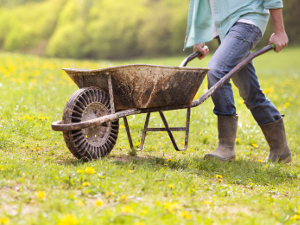 Non-biodegradable choices won't enrich the soil, but will help with everything else, although you may need to place something else underneath to stop weeds peeking through. 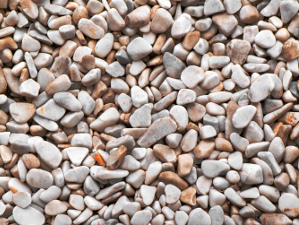 Stones, shingle, pebbles, sea shells and slate will make an attractive finish for beds and containers. Create an individual look with coloured gravel or even glass beads. For new borders, substitute sheet mulches, making holes to facilitate planting through them. Choose a permeable variety to allow water to penetrate it, and disguise its ugliness with something decorative. Be aware that plastic sheeting won't necessarily keep out all light to banish unwanted vegetation, as the ultra-violet rays of sunlight can penetrate it, and cause it to disintegrate. Old carpet will completely smother anything underneath it, but will have to be removed before any gardening can be done. When and how should mulches be applied? Add them in spring and autumn, making sure the earth is warm and moist. If it's too early in the year, or you're working in freezing conditions, you will prevent the sun's rays from reaching the soil, so that roots will stay cold and dormant. Later in the year, a mulch can preserve valuable moisture but it must be applied to a damp surface. Remove it in spring and autumn, making sure the earth is warm and moist. If it's too early in the year, or you're working in freezing conditions, you will prevent the sun's rays from reaching the soil, so that roots will stay cold and dormant. Later in the year, a mulch can preserve valuable moisture but it must be applied to a damp surface. Biodegradable mulches should ideally be as much as 7.5 cm thick (3 inches,) but less is acceptable as long as it's at least 5 cm (2inches). Leave room around woody stems, to prevent decay or the introduction of diseases in wet weather. When treating trees and bushes, spread the material right to the edge of their canopies. During dry spells remember to keep watering well, so that the protected area doesn't dry out. Fertiliser can be placed on top in late winter, leaving the rain to carry it through to the roots below. Of course, if you prefer to actually incorporate material from the compost heap into your plot, that needs to be done first so that it's underneath. If you want to introduce new plants, pull back the top material first (and remember to leave air around the young stems. Mulches can eventually form a hard impenetrable crust, so remove and replace them when necessary. What about mulching the lawn? The benefits here are similar to those for other parts of the garden. At its simplest level, it saves collecting and disposing of cut grass. Being composed mostly of water, they pose no problems unless you have weed seeds among them. They will add nutritious nitrogen, cutting down on the amount of lawn fertiliser you have to buy. To properly incorporate the clippings, specialised mower kits are available. Of course, they can also be added to a compost heap to enter the process that way. Although all of this is extra work initially, it will save effort, and it will certainly enhance and prolong the life of your garden. Taking just these few precautions a couple of time a year will leave you with more time to sit back and enjoy your surroundings!